Licensed since 1998, David has represented over 5000 people injured in motor vehicle accidents. David has tried over 50 civil and criminal cases to a jury verdict. David has worked tirelessly to assist his clients recover millions of dollars. David started his practice defending indigent criminal defendants as a court appointed attorney. During his career as a defense attorney, David tried a wide range of criminal law cases including first degree murder, possession of controlled substance with intent to manufacture or distribute, theft of intellectual property, theft of property over $60,000.00 as well as many misdemeanors. David has many DUI trials under his belt and has obtained acquittals in many of the cases he tried. David has represented defendants in jury trials in both state and federal court. David’s client was acquitted in 2001 after a federal jury trial of possession of over 100 kilos of marijuana and conspiracy to possess over 100 kilos of marijuana. This acquittal is believed to be the largest single defendant acquittal in federal court in the State of Tennessee. See United States v. Ray Reid, Middle District of Tennessee, Federal District Court, 2001. David learned his trial skills as a criminal defense attorney. Those skills have proved useful as he dedicates most of his practice to representing people who have been injured in motor vehicle accidents. David has tried many personal injury cases to a jury verdict. But, that is not his goal. David prepares each case methodically as if it were going to trial, but, over 90% of his cases settle before suit is filed. When necessary, David and his team of attorneys are ready to fight big insurance companies to assist his clients obtain the compensation they rightfully deserve. David has represented many attorneys, judges and doctors accused of misconduct. Using his skill learned as a defense attorney, David knows how unsettling it can be for a professional to be accused of misconduct. David understands the hardships that professional faces during the accusation process and subsequent litigation associated with a law or medical license. David has represented lawyers before the Tennessee Board of Professional Responsibility including disciplinary hearings and reinstatement hearings. David has represented chiropractors and doctors before the Tennessee Board of Health in matters related to alleged misconduct and licensure. David has assisted applicants to the Tennessee Bar in overcoming obstacles in obtaining their law licenses when questioned or hindered by the Tennessee Board of Law Examiners. 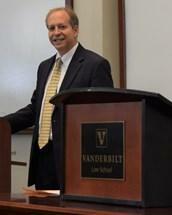 David has assisted the Tennessee Board of Judicial Conduct in the investigation of judicial misconduct. David strives to help other professionals when they face discipline and/or sanction. David has been a guest lecturer multiple times at Vanderbilt Law School, The University of Memphis School of Law and the Nashville School of Law. His years of experience have proved beneficial to countless students during his presentations. David frequently teaches continuing legal education classes for the Tennessee Bar Association, the Memphis Bar Association along with other organizations on topics ranging from personal injury to ethical matters.